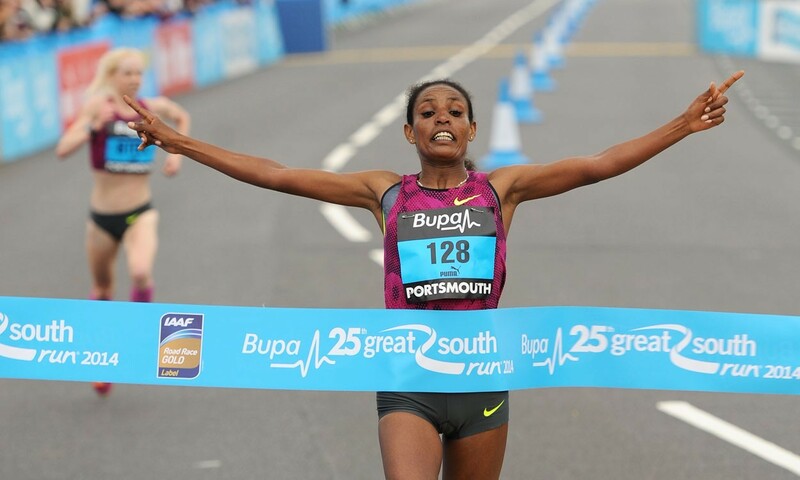 Kenya’s James Rungaru ran a well-judged race to win the 25th edition of the Bupa Great South Run on Sunday, while Ethiopia’s Belaynesh Oljira was the stronger in a sprint finish as she beat Britain’s Gemma Steel by two seconds. Having run a half-marathon PB of 68:13 for the runner-up spot at the Bupa Great North Run last month, Steel had been hoping to go one better on the south coast and she made her intentions clear from the start, leading for the majority of the race and looking strong. The pack started to string out as Steel tried to put the group under pressure and Masai – the quickest over the distance but on a downhill course – was dropped. With three miles to go it was down to two – Steel just ahead with Oljira tucked in carefully behind her. Although London 2012 10,000m fifth-placer Oljira took over at the front for a brief period, Steel was soon back leading and it seemed as though Oljira could be waiting to attack, saving her energy for the tougher final mile and a half where runners head back along the blustery coastline. Steel looked in control, though, and when Oljira made a move with the finish line in sight the 28-year-old fought back with gritted teeth, but the Charnwood athlete couldn’t match late entry Oljira’s finishing speed. The 24-year-old crossed the line in 52:40 as Steel finished two seconds behind her, her time of 52:42 a PB by over a minute to put her seventh on the UK 10 mile all-time list. Behind them Changeiywo ran 54:18 for third as Wanjiku was fourth with 54:59. Steel, who is a regular with Nova’s road races and also has two European Cross medals to her name, said: “I came here to try and win it and I’m the bridesmaid again, never the bride.” She explained how she had tried to make it a hard race for her competitors knowing that she might not be able to rely on her sprint finish. 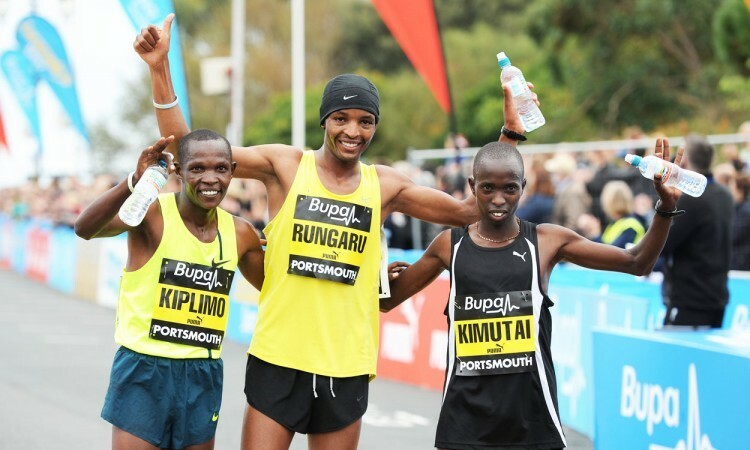 Over in the men’s race and 21-year-old Rungaru had been among the early leaders as he settled himself within the lead pack of six also including eventual runner-up Abraham Kiplimo of Uganda and fellow Kenyans Emmanuel Bett – the defending champion – and Joel Kimutai – an impressive winner of the Great Birmingham Run from Bett the weekend before. Kimutai seemed dominant in the early stages, leading the pack through three miles in 13:52. After a 4:33 fourth mile, Kimutai was showing no fear and the fifth mile was run in 4:29. Despite the pace slowing slightly, Australia’s Commonwealth marathon champion Michael Shelley was dropped and as the group began to string out Kiplimo began to establish a clear lead. But keeping the Commonwealth marathon bronze medallist in his sights, 10 mile debutant Rungaru – who represented his nation at the 2011 World Cross and has a half-marathon best of 61:51 – was far from beaten and gradually started to close the gap, easing past to claim victory in 46:31 as Kiplimo slowed on his approach to the line, crossing seven seconds later with apparently nothing left in his legs but second place secured. Third place was claimed by Kimutai with 47:21 as Shelley clocked 47:39 for fourth. Ross Millington was the best of the Brits, running 48:13 for seventh on his 10-mile debut. Ryan McLeod and Luke Caldwell also made it into the top 10, both clocking 48:47, while Matthew Hynes ran 48:48 for 11th, one place ahead of double European medallist Andy Vernon with 48:53. The day before and Victory’s Zack Lahlal and Sarah Rendell of Alchester had won the Great South Run 5km event in 15:47 and 18:30 respectively. Over in Germany and the Frankfurt Marathon was won by Kenya’s Mark Kiptoo with 2:06:49 and Ethiopia’s Aberu Kebede with 2:22:22. On home soil Arne Gabius ran 2:09:32 on his debut, while Britain’s Emma Stepto finished a fine seventh, the 44-year-old clocking a 2:32:40 PB.